High-Ranking North Korean Intel Officer Defects To South Korea : The Two-Way The military officer's defection follows the news of 13 North Korean restaurant workers who defected en masse last week. 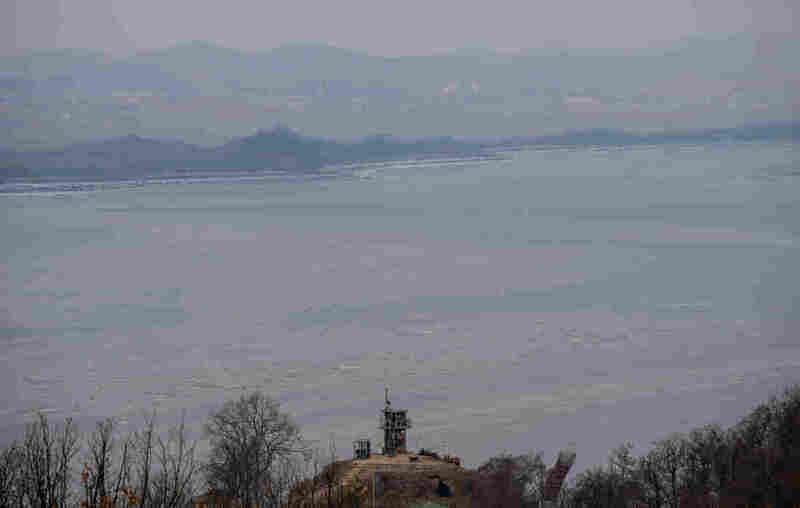 A photo taken on February 8 shows a South Korea military post in front of the Demilitarized Zone and the North Korean shore line, seen from Paju. A North Korean military intelligence officer has defected to South Korea, the South's Unification Ministry announced on Monday. While declining to give details, ministry spokesman Jeong Joon-hee confirmed the man is a colonel and called the defection "meaningful." He is believed to be one of the highest-ranking North Koreans to defect to the South. Jeong said the defection could be read as a sign of fissure at the top levels of North Korea's regime. The announcement comes just days after South Korea said that 13 North Koreans who worked at a state-run restaurant defected en masse last week. Chinese officials confirmed Monday that the North Koreans were working in China, that they left China April 6 and that they were North Korean passport holders. It is unclear when the high-ranking military official defected to the South. Defectors are often questioned and debriefed for months before news of their defections is publicly announced. In this case, South Korean news wire Yonhap reports the official defected sometime last year, which immediately sparked criticism that the government's announcement is politically motivated: South Koreans go to the polls in parliamentary elections this week, and previous governments have similarly been accused of trying to influence elections with conveniently-timed announcements. At the Unification Ministry press conference Monday, reporters questioned the timing of the announcement and the veracity of quotes from the restaurant workers that have been released to the press. The quotes cite the freedom and ideals of South Korea as their reasons for defecting. "How do we know this is real? We're not just writing down whatever you say," a Korean reporter asked the Unification Ministry spokesman. "It's true. I wouldn't write fiction," Jeong responded. Haeryun Kang contributed to this post.